Nighttime accessory designed to help wearers sleep better and wake up feeling more refreshed. 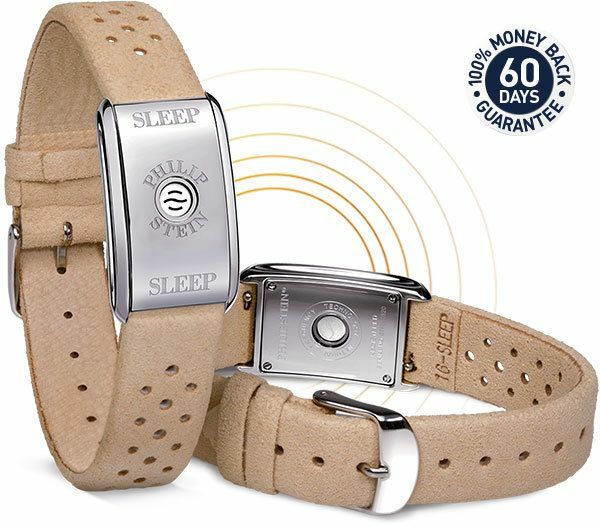 WHAT DOES THE SLEEP BRACELET DO? It helps you to sleep better, wake up more refreshed, and improves your quality of sleep. It’s Philip Stein’s proprietary natural frequency technology. You might experience falling asleep faster, sleeping deeper, dreaming more vividly and waking up more refreshed. HOW FAST DO YOU FEEL THE RESULTS? Each experience is unique. Some feel a change in their sleep immediately, for others it might take days or weeks. We suggest to wear it for a full 30 days for maximum results. We cannot give a guarantee, as the experience of the people differ. Yes, Simon Fraser University in Vancouver, Canada conducted a study of the human cell culture when it is exposed to our technology. The study showed an average increase of 20% in natural melatonin production. Place it or your wrist 15-30 min. before going to bed, or while taking a nap. Remove it when you awake. CAN I USE IT DURING THE DAY? The Sleep Bracelet should not be worn during the day, or while driving. Only to be used when sleeping. An ultra soft microfiber strap and a stainless steel case which houses our natural frequency disc. DO THE BENEFITS LAST FOREVER? Yes, they will last as long as you use the bracelet. No power or battery required. CAN IT HAVE SIDE EFFECTS?